A man stands with a pointer pointing to a drawing of a three-dimensional rectangular object resting on its side. Man: It’s exactly the same from both sides. Five audience members are present, with only the backs of their heads shown. Two are presumptively female and three are presumptively male. Audience member 1 (counting left to right), presumptively female: Ah! Beauty, thy name is symmetry. Audience member 4, presumptively female: Actually, USB. Two men and one woman are seated at a curved table. In front of them, on the table, are two flat objects that might be tablet computers, and a very large book opened in half and resting flat on the table with its spine towards the bottom. Man 1 is touching the large tablet computer in front of him. The woman is touching a smaller tablet computer with one hand and gesturing with the other hand. Man 1: Positive and negative charges must not mix. Man 2 has his hands on the large book and appears to be pointing to a location in the text with his hands. Man 2: Also, keep the AC and DC separate. Man 1: Let’s make the plug go in only one way. A man is kneeling on the floor, stooping, and looking at the back of a computer on the floor that has a tower form factor. The man is apparently performing some task at the back of the computer with both hands. Wires can be seen hanging from the back of the computer. A woman stands behind the man looking towards him. Man: Still won’t plug in. Woman: Try turning it 180 degrees. Man: How much is 180? Title: How They Designed USB. 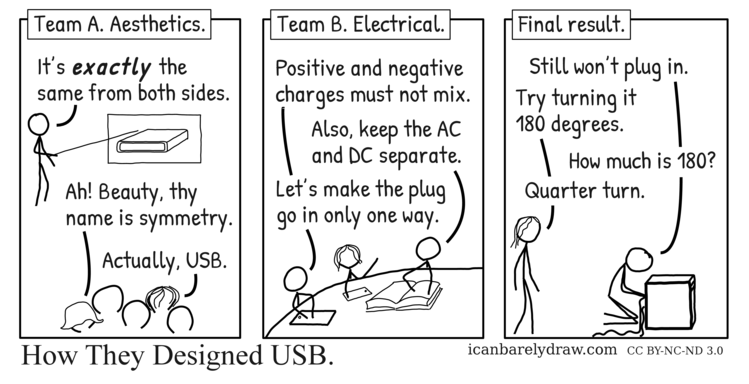 Ah, USB, the most toublesome device known to man.